Recently, Mother Nature gave an unexpected gift to homeowners in the Midwest as a wave of spring showers helped green numerous lawns, brown and dormant from the winter chill. Landscaping bricks have many uses in regards to outdoor décor. Some homeowners prefer to use landscaping bricks to create an accentuated walking path to their home, while others prefer to stack the bricks to build a formal patio. 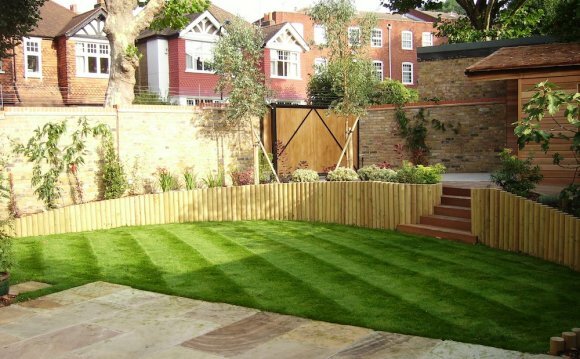 Personally, I prefer creating circular barriers around trees, shrubs and plants with landscaping bricks to contain and separate the planting soil and mulch from the surrounding grass. Depending on the size and type of project, you may want to consider hiring a contractor to ensure the project is done correctly and won’t require constant repair and upkeep. Adding landscaping bricks to your lawn can help create separate spaces in your yard, adding ambiance and consistency to your presentation. Adding mulch to your outdoor décor not only insulates the soil around plants and flowers, it also adds a touch of personality to your lawn as mulch is available in numerous colors. You can coordinate the color of your home with the mulch color you choose or simply accent the trees or shrubs on your front lawn with shredded wood mulch. While mulch is available in various materials, popular brands sell 20-pound bags of mulch for under $10. There are thousands of types of flowers that all capture and embody the pleasure, perfection and beauty of nature. Flowers inspire happy feelings, and many varieties are quite inexpensive. With this being said, it’s no surprise that flowers are the lawn accent of choice for many homeowners throughout the world. Weather you decide to go big with an elaborate and colorful flower presentation, or take a simplistic approach with a few uniform color flowers lining your lawn’s edge, flowers and plants will definitely brighten up your home’s appearance. In terms of landscaping, hardscape is the practice of organizing, cleaning, and shaping up the paved areas such as streets and sidewalks. If you live in a big or highly populated city like New York, chances are there aren’t many sprawling green lawns in your area. In this event, you can upgrade the area in front of your residence through hardscaping. Upgrading your fences, patio, landscaping rocks, and walkways are a few of the ways you can hardscape your home. Hardscaping can provide the final touches you need to complete your lawn upgrade. It’s a nuisance to your houseguests and prospective home buyers (if your home is on the market) to search continually and unsuccessfully for a home address that seems to be created with ten-point font. There are many ways you can display your house number: painting it on the curb or the rise of a stair on your front porch, inlaying in a stained-glass window, attaching decorative numbers to your façade, displaying a customized lawn sculpture, or simply putting fresh stickers on your mailbox.